Yet our solitude is far from cavernous, we crave and pay dearly for great expanses of glass, for doors and windows that fold, slide and lift away to let the world take part in our reverie, day and night, good weather and poor, all year around. The barrier between outside and in, the threshold if you will, has never been more visually vacant. So it is with bewilderment and delight that some doors are the antithesis of all that ‘barley there’ design. The pivot door, seen most often as amazing statement pieces at the front of private residences as well as rather flash commercial developments are here to stay – and getting bigger by the day. The year 2019 will see doors that would rival anything you might find in Winterfell or Versailles. Without doubt the pivot door has elevated the experience of egress to something extraordinary. The very action of opening a door of immense proportion, and we’re talking about some as imposing as 5m X 5m, is exciting and dramatic. Mid-century is now being held up so often as the epitome of style, and while it was not always so, back then they did have rather marvellous internal glass doors, some framed in timber, some etched with wild things, but they were effective at allowing light to travel and climate to be somewhat compartmentalised. This century we did away with walls, and with it went the chance to decorate with purpose. However, glass itself has evolved to such a versatile building element that we may forgive or forget the loss of sandblasted flamingos on a sunroom door. 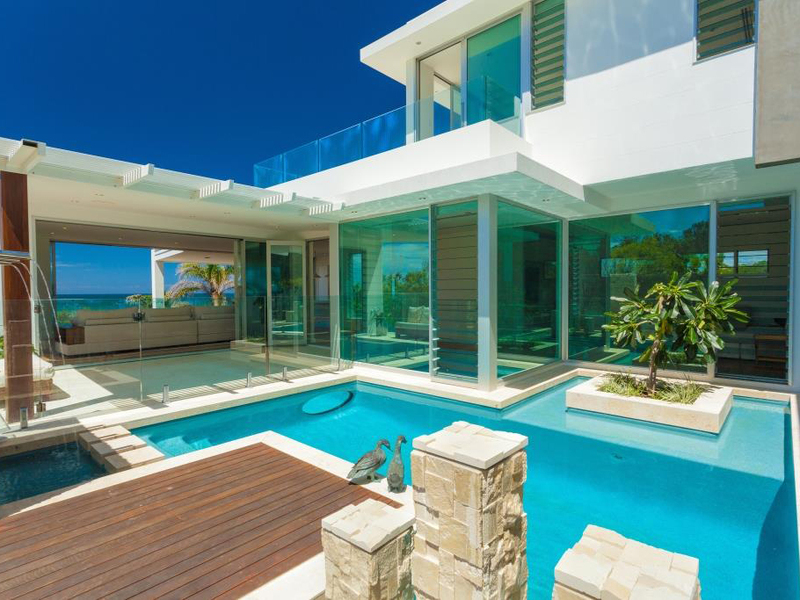 Now architects can specify toughened, laminated, tinted and insulated fenestration options that according to Australian Glass Group, can reduce heat transfer by over 50 percent, alleviating at least some of the excesses in heating and cooling. They can toughen glass, create insulated glass, make sky glass and well, the list is lengthy and goes to prove that glass is a highly technical and developing field. The great news here is that the technology hasn’t stalled, and great benefits are just around the corner. According to Viridian we are going to progressively see high performance glass and double glazing become a standard in building design. When you think about double glazing you usually associate it with colder climates like North America and Europe. This is why states like Victoria and Tasmania are leading the uptake of this transformative building material in Australia, and why states, according to Viridian, such as New South Wales and Queensland are reluctant to embrace it. But again, with energy prices on the rise, and challenging weather conditions continuing across the continent more designers and buyers will be seeking out the best options in glazing products. Breezway has expanded its range to include a very smart new product that won “Most Innovative Window System” at the 2018 Fenestration Awards a couple of months ago. The Secondary Glazed Altair Dualair Louvre System answers concerns of older models by placing two Altair Louvre Galleries in the one 150cm commercial frame which results in a number of benefits. The new system is much improved in water penetration resistance (which is perhaps most important to tropical zones) from 450Pa to 620Pa. The virtual double glazing effect offers energy efficiency and enhanced acoustic performance– while still allowing for the rather exhilarating air movement that only louvre windows offer. Also gaining popularity is the frameless window – adding to the magical allusion that there is no barrier between in here and out there. The ‘sashless window’ is a chic idea. Best described as a vertical slider, the panels – from two to even four, can be slid into a variety of positions that allow optimum air flow, reacting to changing needs of every season. Evolution Window Systems offer the Aneeta Sashless, as well as a full range of aluminium and timber framed windows and doors for a clientele who value the bespoke possibilities of using either or both media. A spokesman for the company speculated that their current customers are becoming enchanted by very thick glass, not just glass that is technically impactful, but also glass in windows and doors that had a bit of heft to it. All this does lead to the question, when does a window become a door? And vice versa. We know that doors have become Wi-Fi enabled, and can be answered and opened remotely – will that become the defining point? Not if one were to then counter with the Breezway louvres that can be controlled remotely, and just as well. Some glass doors can have window inserts, some windows have doors (for the paw families), really the concepts are only restricted by imagination, and budget. How do you compare experiences? The excitement of an architecturally well-placed floor to ceiling glass door, paired with a glass balustrade, is the only way to really enjoy a coastal vignette. Equally, when a garden becomes part of the interior courtesy of the supernatural effect of floor to ceiling glass doors that seemingly fold away leaving nothing but a gleaming minty green slash left by the profile of neatly stacked glass blades, more than one’s green thumbs burst twitch with delight. And finally, what we haven’t addressed here is the pure and delightful aesthetics of the timber framed windows and doors, versus those entirely fabricated by man. Wood has some rather wonderful qualities; some tactile, some thermal, some romantic. The fear of maintenance has turned many away from timber products, despite the fact that a little maintenance goes a long way. Some metal frames, not the ‘top of the line’ products mind you, absorb heat and add to the thermal load of a room, unlike genteel timber fenestration. But then again with powder coating options and slim line profiles (or indeed no frame profile at all) aluminium products can be darned attractive. In any event people are certainly coming to grips with the fact that investing in quality windows and doors can in the long term be a money saver, while adding immeasurably to quality and transparency of life.